In my case it's the default PNG, 8-bits, RGBA with 15% compression, but it reliably crashes with JPEG and no matter what settings I use. I already tried loading the factory defaults first but to no avail. 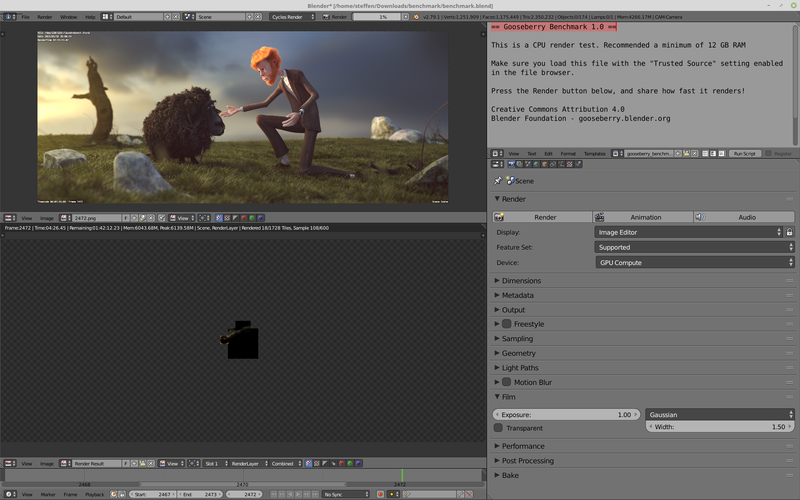 Steffen Dünner (SteffenD) created T63813: Saving images closes Blender. Steffen Dünner (SteffenD) added a comment to T63716: Low Roughness Value on Glass Material Causes Artifacts with GPU+CPU Renders. Steffen Dünner (SteffenD) added a comment to T63632: EXR file rendered without Z pass comes out black. Steffen Dünner (SteffenD) created T63631: Shift + Click in Image Editor crashes Blender. Steffen Dünner (SteffenD) created T63300: Solid + Texture crash Blender. Steffen Dünner (SteffenD) added a comment to T61609: Weird clip start from 3d ortographic views. I can confirm it on my side. Linux Mint 19.1 / GTX 1080ti. Very latest build of 2.80. Steffen Dünner (SteffenD) created T61607: Multilayer EXRs without Z channel give weird results. Steffen Dünner (SteffenD) added a comment to T53341: Weird bug with Particle Instance Modifier. Steffen Dünner (SteffenD) added a comment to T61170: Eevee render engine is too buggy. Have you tried loading the factory settings before? Might be an old startup.blend or preferences saved from an older version of 2.80. Steffen Dünner (SteffenD) awarded D4255: Cycles: Added feature overrides a Love token. Steffen Dünner (SteffenD) created T60468: GPU tiles no longer get denoised. Steffen Dünner (SteffenD) added a watcher for Blender Studio: Steffen Dünner (SteffenD). Steffen Dünner (SteffenD) added a comment to T60153: Blender Cloud Addon 1.11.0 Error Message. Steffen Dünner (SteffenD) created T60153: Blender Cloud Addon 1.11.0 Error Message. Steffen Dünner (SteffenD) added a comment to T59899: Banding Issue. Can you attach a PNG showing that problem? I have no problems here (2.79 and 2.80 no matter what version). I suspect it's an issue with your display driver (or its settings) or another piece of software that changes the display of images on your laptop. Do the images @artem ivanov (ixd) posted look OK for you or do they also show banding? Steffen Dünner (SteffenD) added a comment to T59647: Multiresolution Subdivide Crash with render "Simplify" option. OK, next step. It looks like it's not my user settings but my startup file that contains something that the Multiresolution modifier doesn't like. Hmm... for me it happens on 3 completely different computers, both with my own compile and the buildbot versions of 2.80. Steffen Dünner (SteffenD) created T59647: Multiresolution Subdivide Crash with render "Simplify" option. Steffen Dünner (SteffenD) awarded T54987: Implement Multi-Object Properties Editing a Love token. Steffen Dünner (SteffenD) added a comment to T54862: Multi-Object Properties Editing. This task is marked "Closed, Resolved" but the functionality is not yet inside 2.80. So is this still on the agenda? Steffen Dünner (SteffenD) added a comment to T58183: Cycles combined CPU + GPU render crash. Steffen Dünner (SteffenD) added a comment to T58215: GPU compute crash . 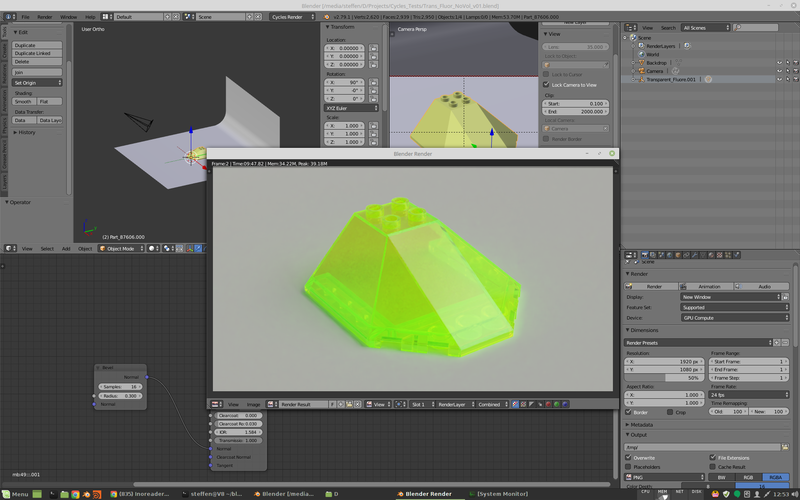 Steffen Dünner (SteffenD) added a comment to T58205: Blender closes/crash on Rendering . Steffen Dünner (SteffenD) awarded T54862: Multi-Object Properties Editing a Love token. Steffen Dünner (SteffenD) added a comment to T57487: Crash with Cryptomatte. Funny. I just compiled the very latest master (17d91bcb611b) and it doesn't crash this easily any more. But it still crashes reliably in CPU mode with "Accurate Mode" off. Steffen Dünner (SteffenD) created T57487: Crash with Cryptomatte. Steffen Dünner (SteffenD) added a comment to T57109: Flickering artifacts in (animated) DOF areas. Also happens under Linux Mint with a GTX 780 and with a Xeon / GTX 1080ti. I gave it a closer look and my initial thought also was that the denoiser freaks out. When you disable the denoiser you can see that there's a lot of noise in the rendered image (where it would be a miracle if any denoiser could properly resolve that BTW). But: it's not the denoiser's fault because the flickering artifacts are already present in the "raw" render! I could reduce the whole scene to only 3 Lego bricks (around the sink) which still gave me the error. The artifacts don't appear if I override all materials with a simple Principled shader. So it looks like the (quite complex) materials (or at least one of them) is faulty or maybe some bump or normal shader doesn't play nicely with a scaling of 0.001 the whole scene is at. Plus I think that setting the render camera limits to 1mm - 2km doesn't help numerical precision either. It might also be a combination of things that cause this, but the Denoiser is innocent. Steffen Dünner (SteffenD) awarded D3712: Cloth: improved collisions a Love token. Steffen Dünner (SteffenD) awarded D3608: Cycles: Expose noisy image pass by default when rendering with denoiser a Love token. Steffen Dünner (SteffenD) awarded D2388: Cycles: initial work to support motion blur from Alembic caches. a Love token. Steffen Dünner (SteffenD) awarded D1987: AO, Samples and Alpha Overrides a Love token. Steffen Dünner (SteffenD) added a comment to T56234: Artifacts when render in Hybrid mode in version 2.8. Steffen Dünner (SteffenD) awarded D3538: Cycles: Added Cryptomatte passes. a Love token. Steffen Dünner (SteffenD) added a comment to T55351: Sss gpu render speed degradation. Depending on your hardware and the scene configuration you might need to fiddle a bit with the tile size to find the sweet spot. In my case it's almost always 32x32 or 64x64 but that can vary. Like with your scene it's 16x16 although I didn't test 8x8. First question: Are you using "Hybrid" rendering in master? Steffen Dünner (SteffenD) awarded T54951: Properties Editor Design a Love token. Steffen Dünner (SteffenD) awarded D1543: Cycles: Add Support for IES files as textures for light strength a Love token. Steffen Dünner (SteffenD) awarded D1973: Cycles: Use proper XYZ <-> Scene Linear conversion instead of assuming sRGB a Burninate token. Steffen Dünner (SteffenD) awarded T54706: Property Override Design a Love token. Steffen Dünner (SteffenD) added a watcher for Code Quest: Steffen Dünner (SteffenD). 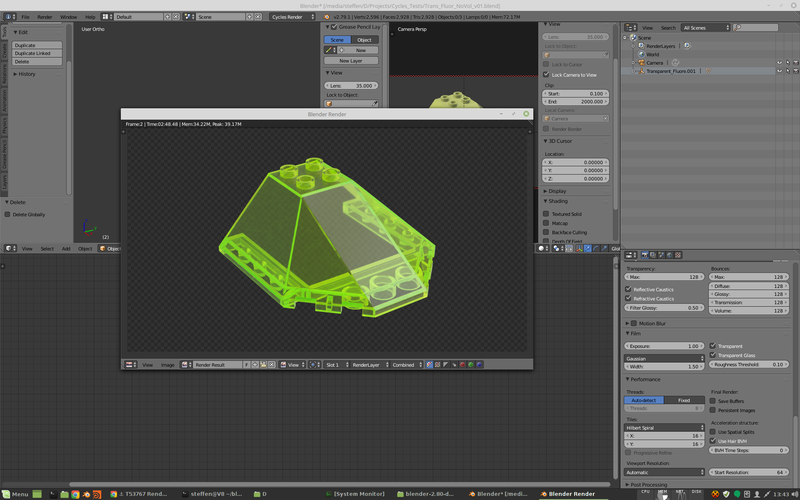 Steffen Dünner (SteffenD) added a comment to T54420: Blender cycles volumetric rendering bug. Steffen Dünner (SteffenD) added a comment to T54388: Glass material and smooth shading generates unwanted dark area. Steffen Dünner (SteffenD) created T54316: Problem with linked objects / texture coordinates. Steffen Dünner (SteffenD) created T54105: Wrong shading with "Random Walk" in combination with branched path tracing. Steffen Dünner (SteffenD) added a comment to T53513: Particle Size Weirdness. After finishing the job that caused me to post this "bug report", I somehow lost sight of this ticket. But on second thought it might actually be worth to re-open it again for the exact reason that ronan mentioned. Render size and simulation size should both be available but the render size should never affect the simulation. Quite the same as changing the instanced object or group doesn't affect the simulation. You should still be allowed to change render settings after caching a simulation. Steffen Dünner (SteffenD) added a watcher for Libmv: Steffen Dünner (SteffenD). Steffen Dünner (SteffenD) added a comment to T53902: Packed Scene with Textures will be rendered wrong. Steffen Dünner (SteffenD) added a comment to T53839: .abc Loads On Ubuntu Fails To Load On Windows 7. Well, here is what Houdini 16.5 says to the attached .abc file. Steffen Dünner (SteffenD) created T53789: Simple Deform giving different results since the new axis option was added. Steffen Dünner (SteffenD) added a comment to T53767: Rendering with Volume Absorption aborts with CUDA Error. Steffen Dünner (SteffenD) added a comment to rBc621832d3d35: Cycles: CUDA support for rendering scenes that don't fit on GPU..
OK, I tried to reproduce my problem today with the very latest own build and couldn't reproduce it. I can now slowly but successfully render the benchmark scene on my +10 years old system with only 12GB of RAM and a GTX780 3GB (on Linux Mint that is). In my case it's not so easy I guess. I just gave it another try on my 10+ years old dual Xeon system with Linux Mint 18.3 and the very latest master of Blender (own compile). It's just the Gooseberry benchmark scene switched to use GPU only. I also made sure to only use the GPU (GTX780 3GB) not the CPU or both. The result is that it starts rendering although the scene would use more than twice the amount of GPU RAM. This is great. I cant manage to get the Gooseberry benchmark to render. Steffen Dünner (SteffenD) added a comment to T53597: CUDA error: Launch failed in cuCtxSynchronize(), line 1372 (SOLUTION: Changing some registry parameters. See the thread for solution details.). I'm not at home at the moment so I can't help with testing stuff, but the TdrDelay issue affects almost any application using CUDA. Allegorithmic Substance Designer and Painter now even display warnings if they find default values in the registry and strongly advise you to change the settings accordingly. Steffen Dünner (SteffenD) created T53513: Particle Size Weirdness. Steffen Dünner (SteffenD) updated the task description for T53341: Weird bug with Particle Instance Modifier. Steffen Dünner (SteffenD) created T53341: Weird bug with Particle Instance Modifier. Steffen Dünner (SteffenD) created T53313: New Bevel shader darkens transparent materials. Steffen Dünner (SteffenD) updated subscribers of T53247: Weird shading problems with the new CPU+GPU mixed mode. @Brecht Van Lommel (brecht) You are a wizard! Thanks a lot! Steffen Dünner (SteffenD) created T53247: Weird shading problems with the new CPU+GPU mixed mode. Steffen Dünner (SteffenD) created T53243: No more UI feedback with animated channels, or disabled properties e.g..
Steffen Dünner (SteffenD) added a comment to T53146: Memory consumption during rendering is no longer updated. I used the new CPU + GPU option in this case. Steffen Dünner (SteffenD) created T53146: Memory consumption during rendering is no longer updated. Steffen Dünner (SteffenD) added a comment to T53134: Some tiles remain noisy with denoising in CPU+GPU render from master. Steffen Dünner (SteffenD) added a comment to T53087: save exr and tga get difference result. This is perfectly normal and expected. Steffen Dünner (SteffenD) renamed T53035: Switching to "Paint" closes Blender from Switching to "Paint" to Switching to "Paint" closes Blender. Steffen Dünner (SteffenD) created T53035: Switching to "Paint" closes Blender. Steffen Dünner (SteffenD) added a comment to rB2d92988f6bc4: Cycles: CUDA bicubic and tricubic texture interpolation support..
Steffen Dünner (SteffenD) added a comment to T52851: Per-frame traking is broken. Steffen Dünner (SteffenD) added a comment to T52781: Memleak (?) with Denoiser. OIC, thanks for your fast response. Steffen Dünner (SteffenD) updated the task description for T52781: Memleak (?) with Denoiser. Steffen Dünner (SteffenD) created T52781: Memleak (?) with Denoiser. Steffen Dünner (SteffenD) added a comment to T52687: Almost all fields for add nodes in compositor listed as "unknown". Steffen Dünner (SteffenD) added a comment to T52689: Regression: Compositing nodes are "Unknown". Steffen Dünner (SteffenD) created T52689: Regression: Compositing nodes are "Unknown". Steffen Dünner (SteffenD) created T52675: Regression: Node Groups in comp crash Blender. Steffen Dünner (SteffenD) added a comment to T52534: Compositing: Artefacts on tile borders when using filters. Thanks for confirming this. Yes, it "works" when scaling first, but in my case all the filters were set to a specific look and I was about to start the playout for the final delivery of several shots in 4k when all of a sudden I noticed this bug. In the end I started resizing all of the render pictures with Fusion. Steffen Dünner (SteffenD) updated the task description for T52534: Compositing: Artefacts on tile borders when using filters. Steffen Dünner (SteffenD) created T52534: Compositing: Artefacts on tile borders when using filters. Steffen Dünner (SteffenD) added a comment to T52479: Regression: Motion Tracking no longer works.